Windows XP/2003/Vista/7/8/10 ACC audio format is a successor of MP3 that provides with flexible conversion settings and high-quality compression. It is the official format for iPhone, iPod and iTunes, but also is supported by various players and devices. Converting FLAC into AAC you can gain more efficient file compression while saving good sounding quality. It is impossible to convert FLAC to AAC without specialized software that supports both formats. You will need Total Audio Converter that is capable of doing single- and multi-conversion between FLAC and AAC formats within a few seconds. The interface of this program was specially developed for both professional and non-professional users, to make compression features available for all comers. 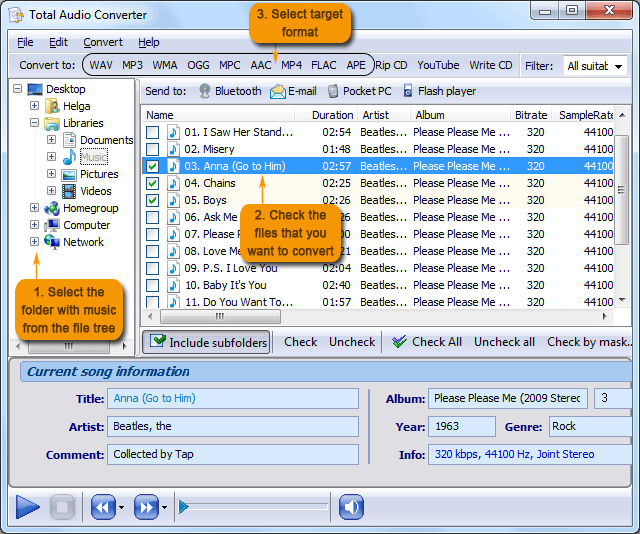 That is why Total Audio Converter gained huge popularity among music users. When you first open the program it becomes clear what actions you need to perform for converting files. At the top of the window is a bar containing all compatible formats. Under it you will see the navigation panel, consisting of folder list to the left and the file list to the center. 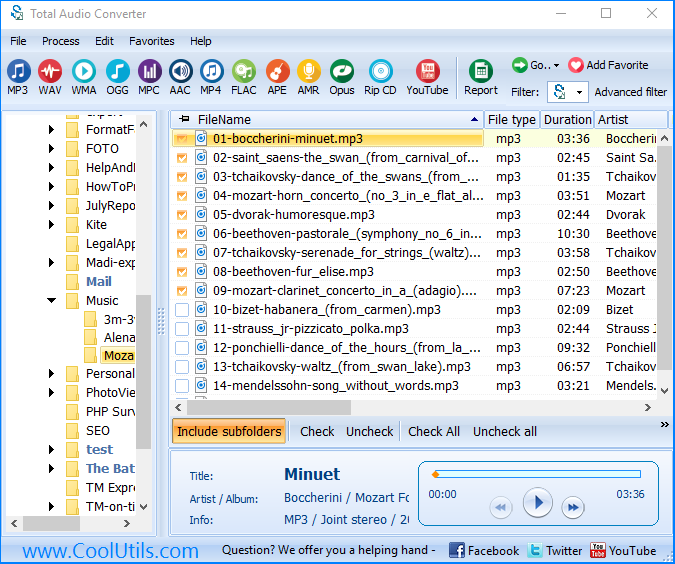 Here you can easily find FLAC source files for conversion and even listen to them using the in-built music player. The options wizard offers to select specific quality lever for the future AAC copies. The quality level influences on the file size and sounding. The higher it is, the better sounding you will get and the larger size the future music tracks will have. 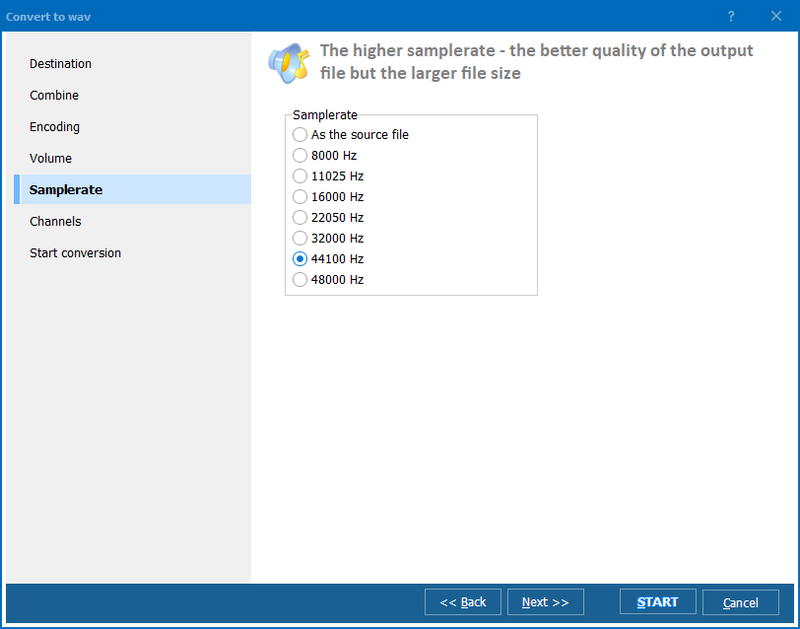 FLAC AAC Converter allows to set a separate file fragment for conversion. It is very helpful feature for compiling different music parts into one file. You can make separate AAC fragments from your FLAC collection and then combine it into one single track. You are welcome to download FLAC converter that will make all conversion job by itself. All you need to do is to select source files and click on several buttons. 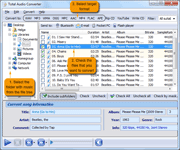 Buy Total Audio Converter right now and get a reliable music helper! Get AUD Converter for an affordable price! Get XM Converter for the best price! How to convert Ape and Cue files? 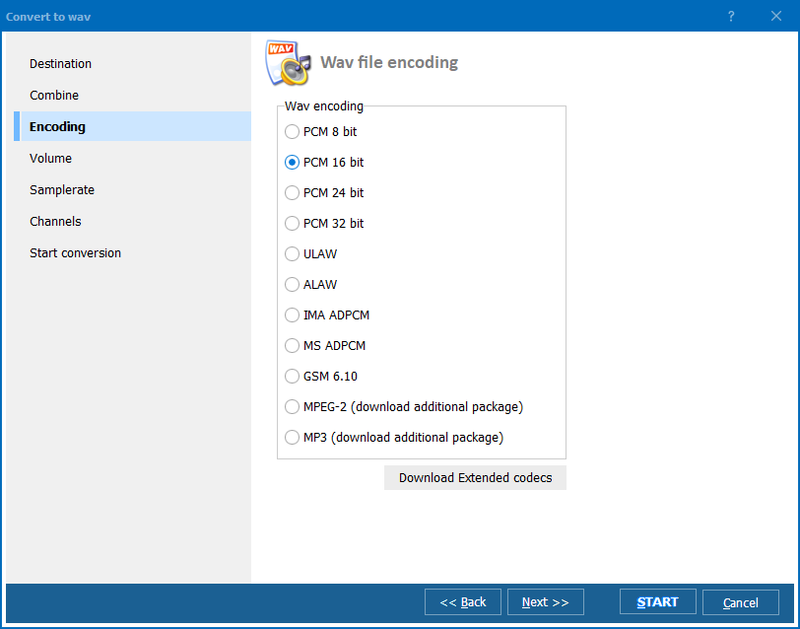 Convert MP3 to WMA. Save time, it's easy. Convert AAC to WMA error-free. Convert CDA to FLAC. Save time, it's easy. Convert CDA to APE Like A Pro! Convert MP4 to WMA. Save time, it's easy. Convert OGG-audio to WAV fast.